It is hard to imagine the hundreds of thousands of children and families who have to experience the traumatic battle of childhood cancer, and even harder to imagine the children who do not have the chance to chase their dreams: to become lawyers, teachers, and doctors themselves. The Vs. Cancer Foundation is changing that. 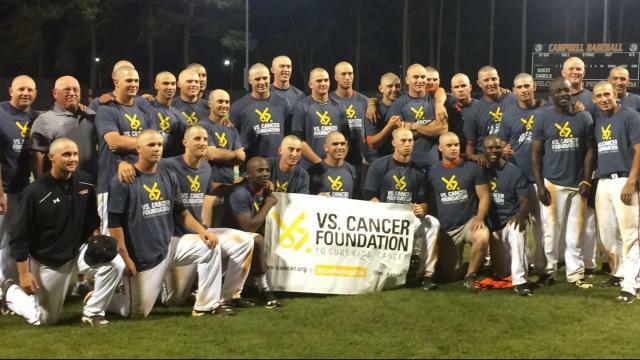 The Vs. Cancer story began when a freshman baseball player at the University of North Carolina was diagnosed with Stage 4 brain cancer. After his treatment, Chase Jones and his teammates decided to shave their heads to raise funds for life-saving research and for programs to help children in their local cancer hospital. Since that time, Vs. Cancer has partnered with dozens of teams to support the children and families impacted by childhood cancer today and to fund research to help make childhood cancer a thing of the past. When Chase learned about Pledge It and how it helps charities leverage their relationships with professional athletes and teams during the season, he immediately thought of his former teammate and good friend, Kyle Seager of the Seattle Mariners. Chase called Kyle to explain how it worked, and Kyle was pumped that he'd be able to raise money for his friend by just playing the game he loved. If you know a professional athlete or have a relationship with a professional team, great! Make sure to leverage your relationship with them. If you don't know a professional athlete or team, consider reaching out to a local college or high school. Many colleges and high schools want their student-athletes involved with their community. But how did Chase and Vs. Cancer Foundation raise $30,000 in 3 days? Before launching the campaign, Chase decided to add a few incentives to motivate his supporters to pledge. Since supporters could donate by pleading for every hit Kyle earned, Chase wanted each incentive linked to the pledge amount in order to reward them for giving more than they usually would. Chase provided the following incentives: a Kyle Seager Vs. Cancer t-shirt for anyone who pledged $0.50 per hit, a Kyle Seager signed ball and t-shirt for anyone who pledged $1.00 per hit, and a Mariners game experience, a signed ball, and t-shirt for anyone who pledged $5.00 per hit. These incentives contributed to supporters pledging 2x more than the average online donation because not only could they support a worthy cause and their favorite player but also receive exclusive items that others couldn't receive outside of the campaign. Always remember to provide an incentive supporters couldn't purchase outside of the campaign. Create a VIP incentive! Kyle and his wife Julie decided to match the first 100 people who pledged instead of making a matching donation. A matching donation is viewed as the charitable gift made toward a non-profit organization by a matching donor under the provision that an original donor first makes a gift toward that organization. Performance based fundraising allowed Kyle and Julie to raise more for Vs. Cancer by using their matching pledge to encourage others to give more. Supporters wanted to pledge a little extra because it meant Kyle and Julie would have to donate more. Chase was able to utilize a new form of fundraising to leverage his relationship with a good friend and professional athlete. By combining physical incentives with a matching pledge offer, Chase and the Seager's were able to raise over $30,000 in just 3 days. The rewards of giving aligned with the incentives, and supporters respected that the Seager's were willing to give more if fans stepped up to the plate alongside them and gave more too.